There are over 3000 parking spaces in a three block radius of the facility. These spaces are available on a first come, first serve basis. Download the parking map (pdf). 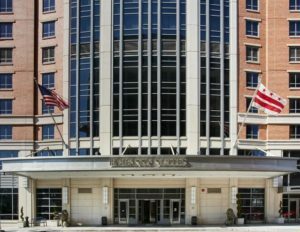 Stay at the Embassy Suites Washington D.C. – Convention Center hotel, centrally located in the heart of Washington DC, just steps from the upscale shopping and dining options in the newly opened CityCenterDC complex. Our hotel is within easy walking distance of the National Mall area, home to Smithsonian museums, the White House and the U.S. Capitol. Walk to the Verizon Center or ride the nearby Metro (3 blocks) to the National Zoo, FedEx Field, National’s Stadium and more Washington DC attractions. All Embassy Suites by Hilton™, all guests are welcomed with a two-room suite, free made-to-order breakfast each morning, and complimentary drinks and snacks for two hours every night. Take the Blue, Orange or Red line to Metro Center. Follow signs for the 11th Street and G Street exits. Make a right onto 11th Street, and head north for 3 blocks. Make a right onto New York Avenue, then a left onto 10th Street NW. The hotel is on the left, in between New York Avenue and K Street NW, located on 10th Street NW. Valet: $45 + 18% tax/night – Max garage clearance 7 ft. Experience the excitement of the nation’s capital with a visit to our hotel. Perfectly located, the Renaissance Washington, DC Downtown Hotel is an extraordinary destination for business and leisure travel. 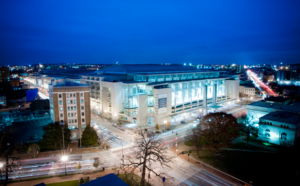 You’ll find us in the heart of the city, moments away from legendary landmarks including the White House and the National Mall; Walter E. Washington Convention Center and the Capital One Arena are within walking distance. Stylish rooms and suites offer pillowtop bedding, comfortable workspaces and terrific city views. Enjoy lunch, dinner, or drinks at Presidents Sports Bar & Grille during your stay. Break a sweat at our on-site Vida fitness center or pamper yourself with a soothing treatment at Aura Spa. Our downtown location and expansive event venues make us an outstanding choice for meetings and events in DC; complement your gathering with customized and innovative catering. Visit the Renaissance Washington, DC Downtown Hotel and discover a modern home base in the middle of the vibrant city. ©2018 Access Intelligence, LLC. All rights reserved. Learn more about licensing or reproducing content on this site.